Atlético Madrid ended last season in some style, just missing out on a Champions League place after surging up the La Liga table and then winning a terrific Europa League final 3-0 against Athletic Bilbao with two goals from their prolific Colombian forward Radamel Falcao, the man known as “El Tigre”. This was particularly impressive after their faltering start following the sale of many leading players last summer, including their South American strikers, Sergio Aguero to Manchester City and Diego Forlán to Inter. This European success was the second time that Atlético had triumphed in Europe’s “second” competition in three seasons, as they also secured the trophy in 2010, when they dashed English hopes by beating Fulham (after overcoming Liverpool in the semi-final). That was Atlético’s first European silverware for nearly 50 years and their first trophy of any kind since 1996, when they memorably won the domestic double. Although Atlético can legitimately claim to be Spain’s third biggest club historically, the fact remains that it is many years since they won most of their nine league titles (and nine Copa del Rey trophies), leading to their reputation as the great under-achievers, which is especially poignant for a club with such passionate, committed support. Their numerous fans have become accustomed to failure, not least compared to their illustrious neighbours Real Madrid, whom they have not defeated since 1999. Indeed, Atlético were actually relegated to the Segunda División in 2000, returning to the top flight two years later under the guidance of the legendary Luis Aragonés. "Adrián López - one way or another"
As well as managing Atlético in four different spells, Aragonés was also a long-serving player, scoring the goal in the 1974 European Cup final against Bayern Munich that so nearly brought the trophy back to the Vicente Calderón before a last-minute equaliser forced a replay that the Germans won 4-0. Fans will hope that the current manager Diego Simeone, also a much-loved former player, goes on to emulate Aragonés’ feats and rediscovers the club’s glory days. He certainly made a good start, coming in to replace the hapless Gregorio Manzano last December, and inspiring a recovery in the second half of the season. The football may not have been the most attractive to watch, but there is no doubting the results achieved. He has established a solid base on which the club can build, always assuming that they can hang on to their key players, notably Falcao, but also including the likes of strike partner Adrián, Turkish international Arda Turan, the uncompromising Uruguayan defender Diego Godin, and Spaniards Gabi, Juanfran and Mario Suárez. 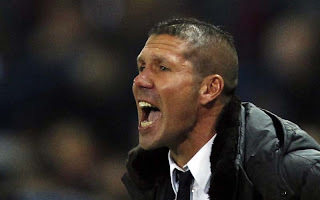 "Diego Simeone - when the going gets tough..."
That is by no means a given, as nobody can ever be sure of the direction that Atlético will take, due to their numerous issues off the pitch. A highly dysfunctional board has taken some bizarre decisions in the past, leading to some desperate financial problems. Indeed, it is arguable that one of the main drivers for Simeone’s appointment was the belief that his popularity with the fans would cause them to stop their protests against the club’s directors. Atlético supporters certainly have much to complain about, as they have suffered from years of poor management (to say the least) ever since the infamous Jesús Gil became club president in 1987. A man for whom the description “colourful character” could have been invented, Gil was a controversial property magnate and politician, who ran the club in his own inimitable style. In his day job, he was given a five-year prison sentence for his company’s role in the collapse of a building that resulted in 58 deaths, though the dictator Franco later pardoned him. He was also suspended by both UEFA (for calling a referee a homosexual) and the Spanish FA (for punching another club president), while he spent millions on bringing star names such as Paolo Futre to Atlético without much tangible return on the pitch. Even more scandalously, the courts found his consortium guilty of fraudulently acquiring Atlético Madrid during the club’s 1992 flotation, though they were rescued by a statute of limitations. Things have not improved since Gil’s death in 2004, with control now residing with his son, Miguel Ángel Gil Marín, who is the majority shareholder and chief executive, and Enrique Cerezo, the club president. The mutual antipathy between these two individuals is apparent at every turn with each taking decisions to deliberately contradict the other. The club’s shambolic strategy is reflected in the vast number of managers that have been hired and fired during the Gil era. It is difficult to keep track of the exact number, but most estimates suggest that the club has gone through nearly 50 managers in this period, featuring names like César Luis Menotti, Javier Clemente and Ron Atkinson, including 16 since 1996, the year of their last domestic success. The lack of continuity is further emphasised by the confused activity in the transfer market with an average of 14 new players arriving each season. There is a price to pay for being one of the worst run clubs in Europe, as evidenced by Atlético’s massive debts, which stood at a barely credible €514 million in June 2011, around €62 million higher than the previous year. Notable items included €215 million owed to tax authorities (net €167 million after deducting tax debtors), €77 million to financial institutions, €55 million for transfer fees and €52 million to staff. 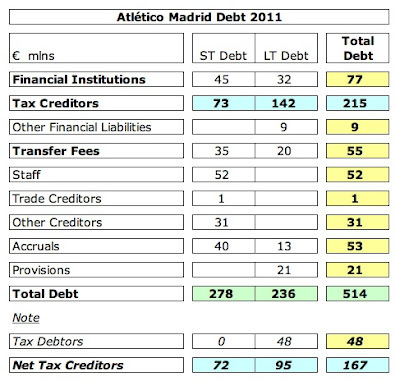 Importantly, much of this debt (€278 million) is short-term in nature, placing even more pressure on Atlético’s finances. 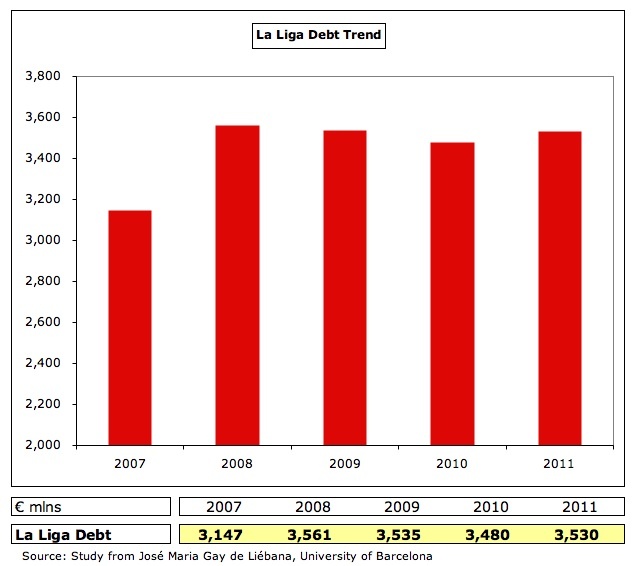 This is the third highest debt in La Liga, only surpassed by Real Madrid €590 million and Barcelona €578 million, though both those clubs enjoy significantly higher revenue. This can be seen by looking at debt coverage, i.e. how much of the total debt is covered by annual revenue, which is around 80% in the case of the two Spanish giants, but a feeble 19% for Atlético. Of course, the most worrying aspect of Atlético’s indebtedness is the vast amount owed to the taxman, which AS newspaper estimated towards the end of last year as €155 million, lower than the figure in the club accounts after the proceeds from the Aguero sale went straight to the tax authorities to reduce the debt. Even after this payment, Atlético’s tax debt is substantially higher than the rest of La Liga with Barcelona the next highest at €48 million and accounts for more than a third of the total owed by La Liga clubs – and their accounts for the last four years have still not been signed-off by the tax authorities. Like many other Spanish clubs, Atlético have agreed a repayment schedule with the tax authorities. It had been mistakenly believed that the agreement was to pay the taxman half of any revenue received from player sales, but the club has to actually pay €15 million every September, regardless of any transfer activity, which helps explain the annual summer outgoings. Even this arrangement may come under pressure after recent comments from the European Commission, which has suggested that delayed tax payments might represent a form of improper state aid. Indeed, in April the Spanish government and football league (LFP) agreed new rules for clubs to settle tax debts, including clubs being obliged to set aside 35% of TV revenue as a guarantee against tax debts from the 2014/15 season and maybe even being forced to sell players to raise funds. Ultimately, clubs could even be barred from competitions. 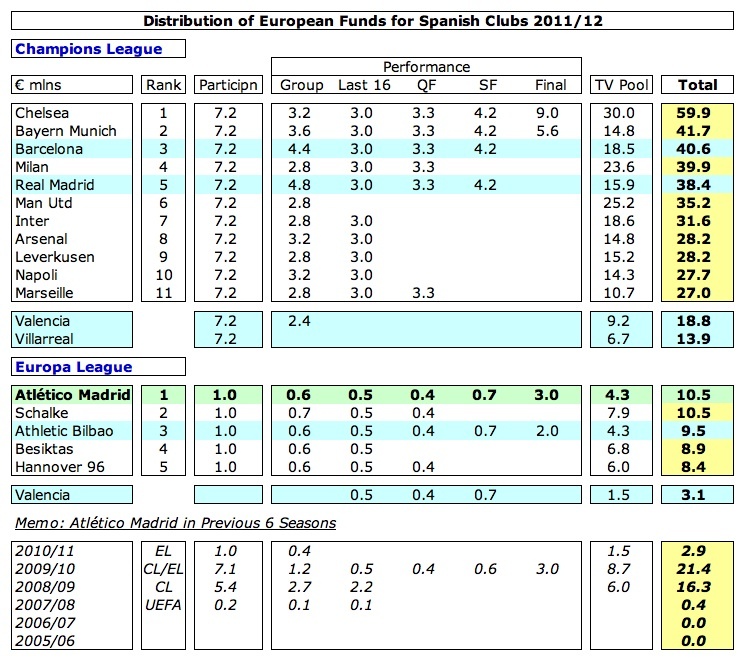 The club states that this is due to their investments in players in order to secure European qualification and is a “situation common to the vast majority of football clubs.” While it is true that few clubs are shining examples of financial probity, not many are in such a bad position as Atlético, even though the directors have given their commitment to cover any cash shortfalls that may arise in future (as they have done in the past). Furthermore, the balance sheet is inflated by €240 million of debtors that relate to the new stadium project, whereby Atlético’s sale of the land around the Calderón will fund the development. The accounting for this is complex and fairly opaque, so much so that the auditors make no fewer than four “exception” comments about these transactions, though they did ultimately sign-off the accounts. 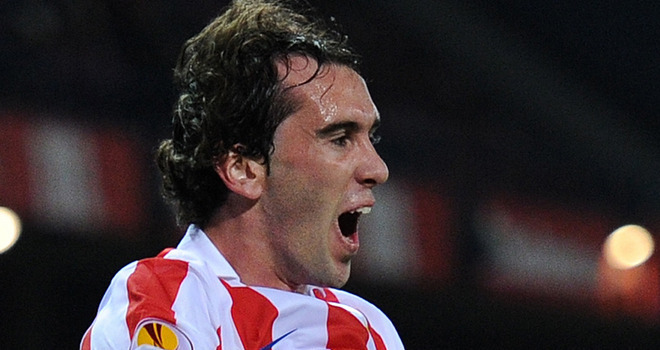 "Diego Godin - please don't go"
There have been a couple of incidents of late payments reported recently which may be indicative of some wider issues. First, Diego the midfielder on loan from Wolfsburg last season filed a claim for unpaid wages. Although the amount he claimed was relatively small, the €52 million of debt owed to staff represents 81% of the annual wage bill of €64 million, which is far from trivial. 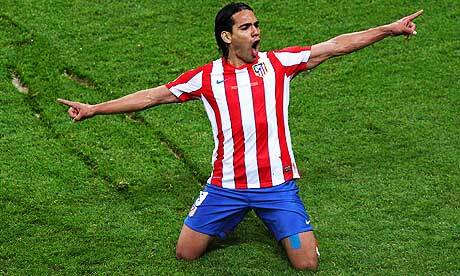 Similarly, Marca have written that Atlético are behind in their payment schedule to Porto for Falcao’s transfer. This cost €40 million (plus €7 million in incentives) and included €18 million to be paid in two annual instalments of €9 million with the newspaper claiming that only €6.5 million had been paid this year, which could lead to Atlético being reported to FIFA (and a potential transfer ban). So how did Atlético find themselves in such an awful financial predicament? Obviously the lack of sporting success has not helped, e.g. Gil Marin revealed that €46 million of the tax debt arose from their time in the second division, when they stopped paying tax, while a further €50 million was charged following tax reviews, largely due to profits booked for property sales. 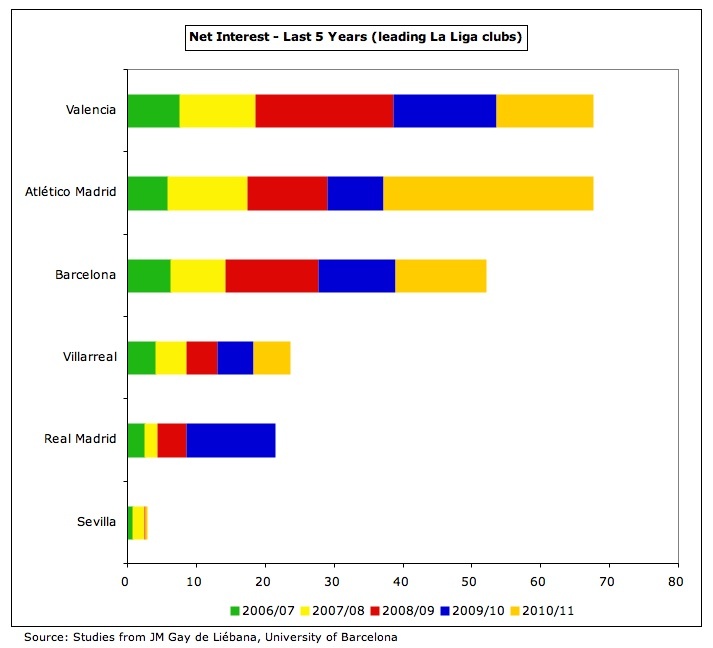 However, much of the debt is down to rank poor management, in particular some highly questionable purchases in the transfer market, where they splashed out €165 million (net) in the seven years up to 2008/09, even after selling the fans’ idol Fernando Torres to Liverpool for €38 million in 2007. Since those heady days, the cold wind of reality has blown through the club’s corridors, as they have generated net sales proceeds of €21 million in the last four years. Last season they received an incredible €88 million from selling players, largely Aguero €45 million, David De Gea (to Manchester United) €20 million, Elias (to Sporting Lisbon) €8.8 million and Forlán €5 million. However, they were still spending with Falcao representing one of the most expensive purchases of the summer, though half of this was funded by a an investment fund with super agent Jorge Mendes playing a key role (as he did with a couple of other buys: Elias and Silvio). So far this summer the club has been even more frugal with the only outlay being the €1 million paid to Getafe for Cata Diaz with the other arrivals coming in on a free transfer, including Emre from Fenerbahce. On the other hand, there have already been two big money sales with Argentine midfielder Eduardo Salvio moving to Benfica for €11 million and promising young midfielder Álvaro Domínguez joining Borussia Mönchengladbach for €7 million. This new austere approach is also evidenced by greater use of the loan system with the aforementioned Diego and Belgian goalkeeper Thibaut Courtois from Chelsea. 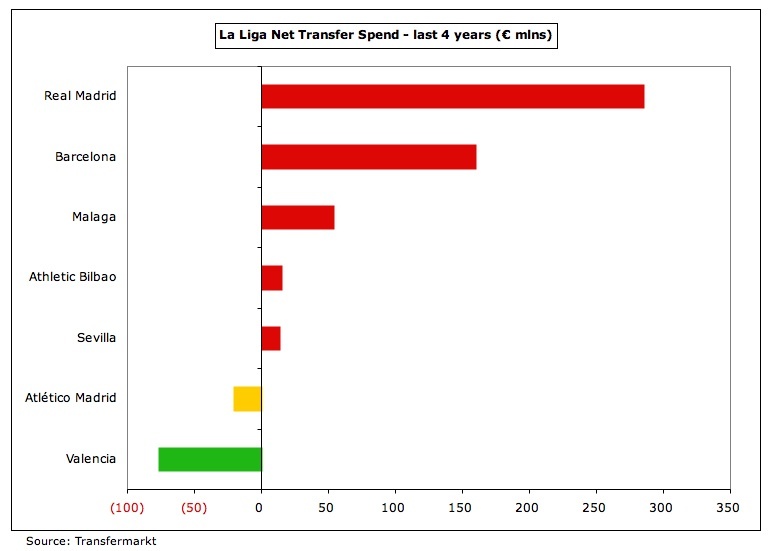 It is also highlighted by looking at the net transfer spend of the leading La Liga clubs in the last four years, where the only club spending less (i.e. selling more) than Atlético was Valencia, also beset with debt problems. In stark contrast to Atlético’s net sales of €21 million, Barcelona’s net spend was €160 million, while Real Madrid indulged themselves to the extent of a hefty €285 million. 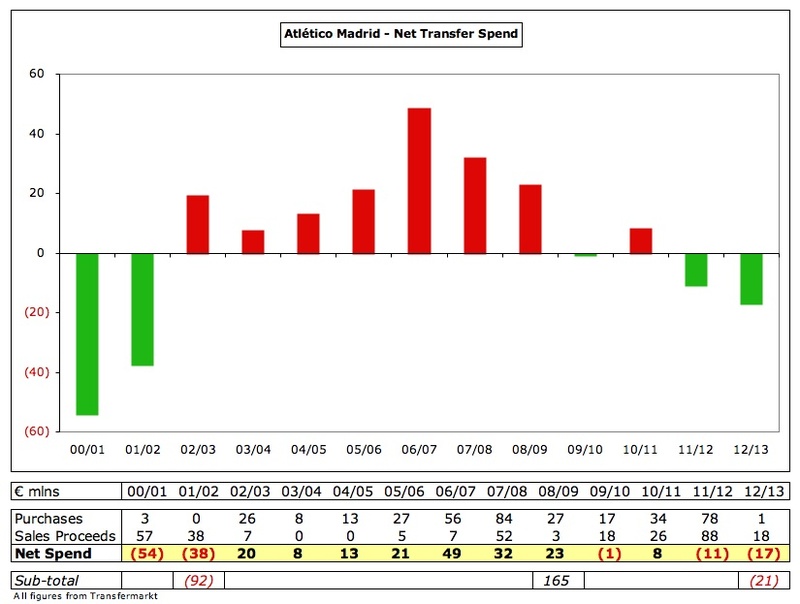 Looking at the profit and loss account, it is not surprising that Atlético have not been so active in the transfer market, as they have reported losses in each of the past three seasons, including €6 million in 2010/11 on revenue of almost exactly €100 million. That said, on paper the losses do not look overly dramatic with the largest being €10.8 million in 2008/09 and just €75,000 in 2009/10. Furthermore, small profits were made in the preceding three seasons. However, the impact of tax credits has been significant with €5.9 million in 2010/11 and €17.7 million in 2008/09. Excluding these, the club’s pre-tax losses become much larger, e.g. €11.8 million in 2010/11 and a sizeable €28.4 million two years earlier. But, I hear you cry, Atlético did at least break even on a pre-tax basis in 2009/10, which is absolutely true, but there is another way of looking at this, namely that in their most successful season for ages, when they qualified for the Champions League and won the Europa League (after parachuting in), they still could not make any money. Nevertheless, compared to some of the gigantic losses at other clubs, these bottom line figures are not that terrible, though they do disguise some worrying points. Interest payments on the debt weighs heavily on the accounts, rising from €8.2 net payable in 2009/10 to €30.4 million in 2010/11, comprising €10.3 million received from investments and €40.6 million on debts to third parties. In fact, Atlético have had to pay a very high €68 million net interest in the last five years. 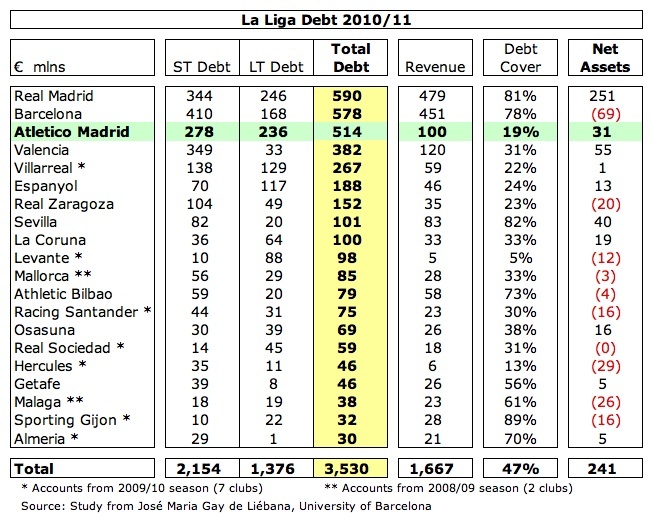 To place that into context, only Valencia have had to pay a similar amount, while Barcelona (€52 million) and Real Madrid (€24 million) have paid much less, despite their larger debt levels. However, the most important point to appreciate about Atlético’s losses is that they would be much higher without the inclusion of substantial asset sales, both in terms of players and property. The former was demonstrated last season with net profits on player sales of €38 million (€43 million profits less €5 million losses). Excluding this (and other unexplained exceptional losses of €5 million), the reported pre-tax loss of €12 million would have been a far more unhealthy €45 million. In the same way, the accounts for many years have included huge profits on property sales (€46 million in 2005/06, €58 million in 2007/08 and €10 million in 2008/09). These are not fully explained, but the point is clear, namely that Atlético’s underlying losses are very large, adding up to a deeply concerning €229 million in the last six seasons, averaging nearly €40 million a season. The figure would have been even worse without the relatively small “real” loss of €4 million in 2009/10, which highlights the importance of European success to Atlético’s business model, assuming that they do not want to sell their best players each season. With no European qualification, Atlético clearly make large losses at an operating level, amounting to €156 million over the last six years. 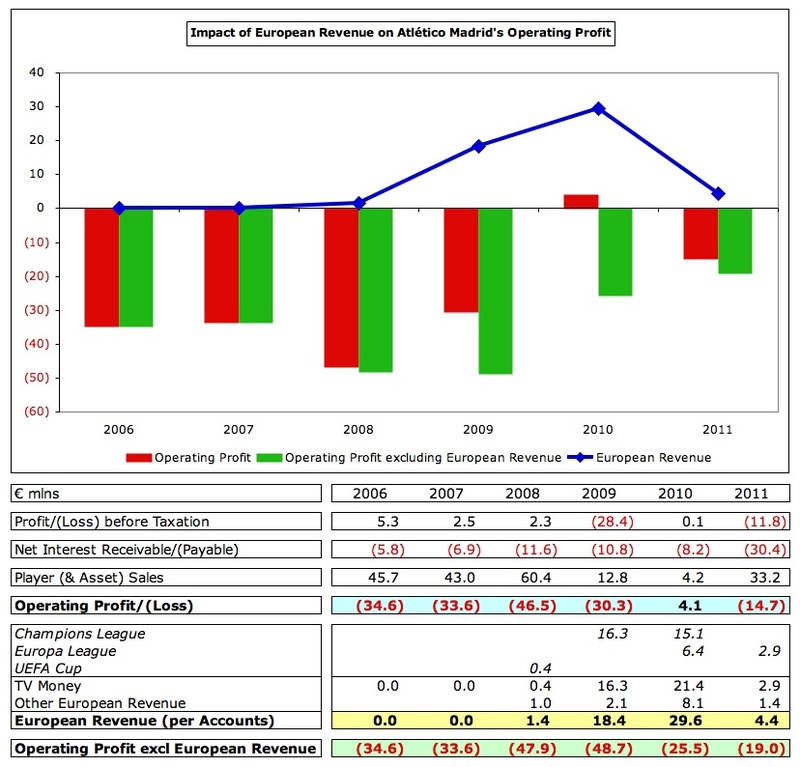 The one year where they made money was unsurprisingly 2009/10 with €4.1 million operating profit, though this included €29.6 million of revenue from Europe. Excluding this windfall, there would once again have been a large operating loss of €25.5 million. 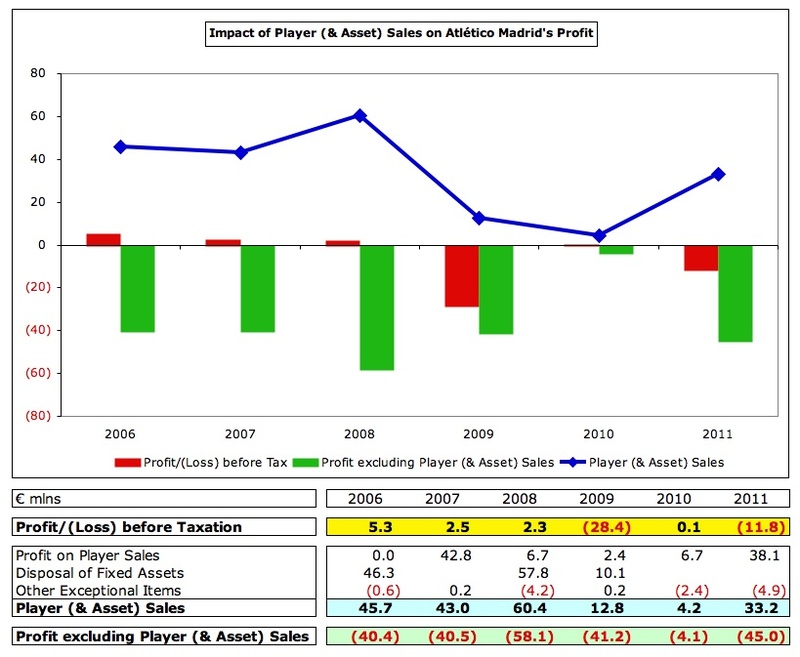 The slightly encouraging news is that the club has made cash profits for the last three seasons, with EBITDA (Earnings Before Interest, Taxation, Depreciation and Amortisation) reaching €10.4 million in 2010/11, even with relatively small European revenue of €4.4 million. This is mainly due to operating expenses being kept under control, especially wages, which actually fell €3 million in the last two years. That said, the great investor (and third richest man in the world) Warren Buffett once cautioned, “References to EBITDA make us shudder. It makes sense only if you think that capital expenditure is funded by the tooth fairy.” As we have seen, this is particularly relevant to Atlético with their large debt leading to high interest charges. That dominance is easily seen by considering revenue of the La Liga clubs. In 2010/11 Atlético generated €100 million, which placed them fourth highest in Spain, €20 million below Valencia, the difference being entirely due to Champions League money. 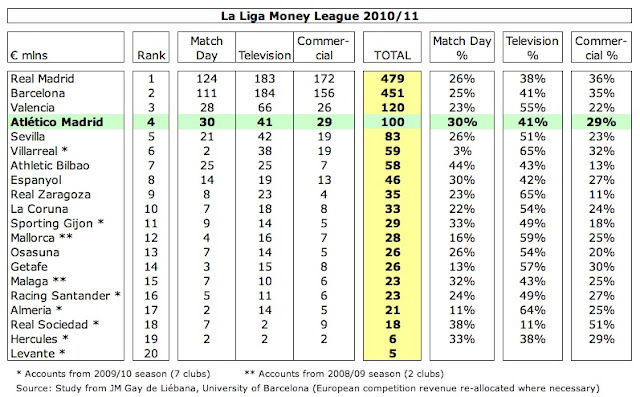 In fact, Atlético are one of only four clubs in La Liga that earn more than €100 million revenue, with the remaining clubs considerably behind them with the next highest being Sevilla €83 million, Villarreal €59 million and Athletic Bilbao €58 million. That’s not too bad, you might think, until you look at the enormous amounts earned by Real Madrid (€479 million) and Barcelona (€451 million). 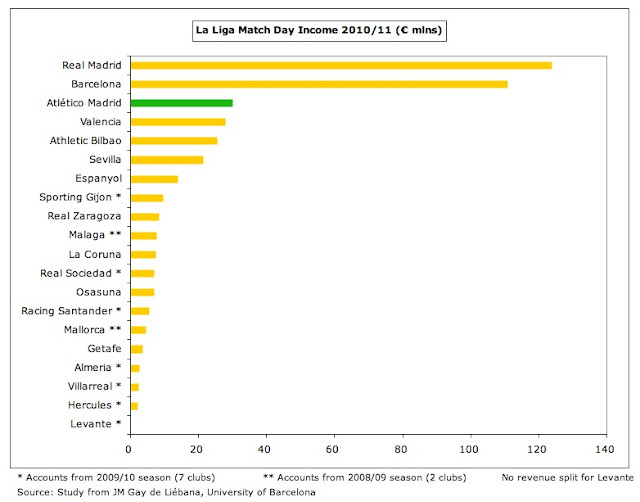 In other words, they earn at least €350 million more a season – every season. That’s not exactly a fair fight: it’s as if Atlético have brought a knife, while the top two are armed with a gun (and a bloody big one at that). 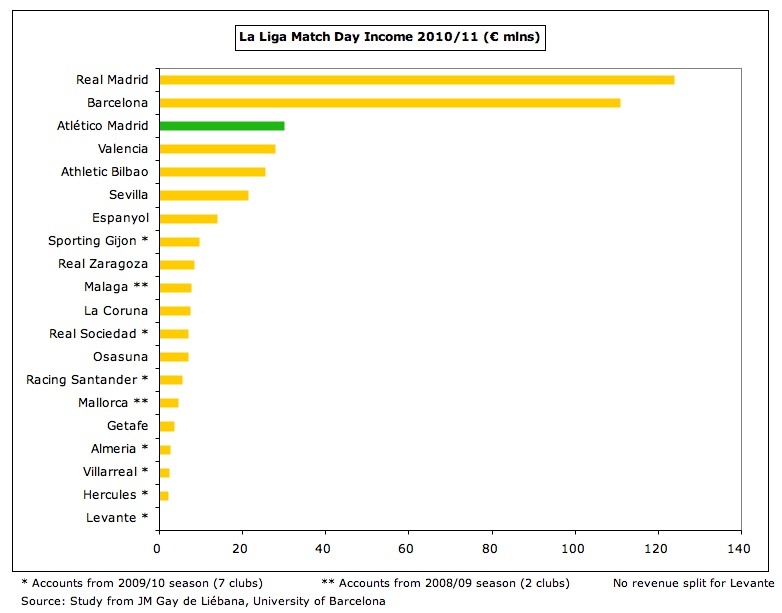 And just to twist that knife a little more, Barcelona recently announced record revenue for 2011/12 of €476 million. 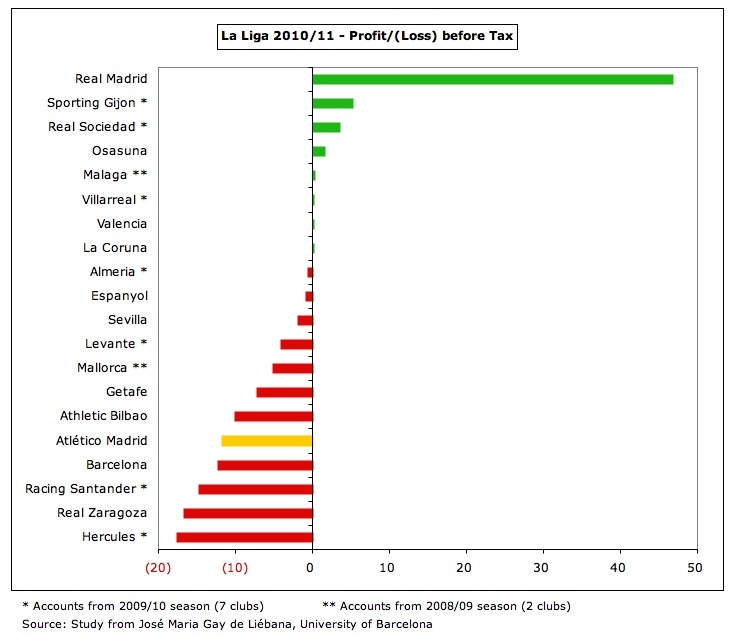 The dispiriting thing is that Atlético’s revenue is actually good enough to put them in 23rd position in Deloitte’s European Money League, just €15 million behind Napoli, who gave such a good account of themselves in last season’s Champion League. However, in this era of stratospheric TV deals and commercial money-spinners, having reasonably good revenue is no longer sufficient, as a select few are now out of sight. 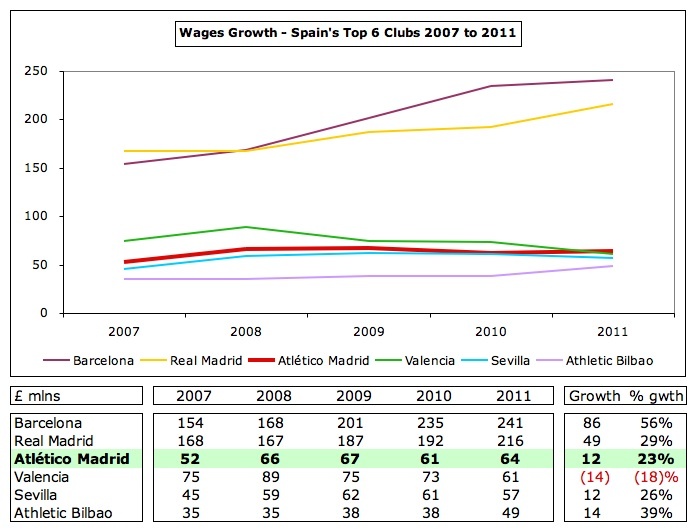 This trend can be clearly seen by looking at the revenue growth of some of Spain’s leading clubs in the last three years. 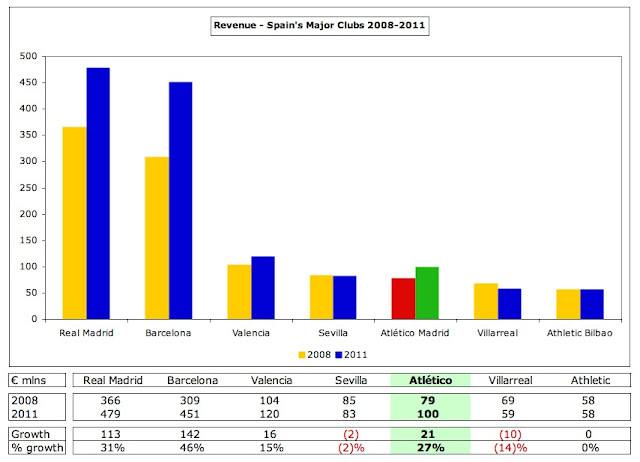 Atlético’s performance is far from shabby, as they have grown their revenue by 27% (or €21 million), which is better than all their peers. Only Valencia have come close with €16 million growth in that time, while Athletic Bilbao’s revenue has been flat, and it has actually declined at Sevilla and Villarreal. Great stuff, but then take a look at Barcelona and Real Madrid, who have increased their revenue by €142 million and €113 million respectively. In short, the gap between the aristocracy and the “commoners” is already colossal – and it’s getting wider every year. The chances of Atlético (or Valencia, Athletic, Sevilla or anyone else) mounting a sustained challenge in Spain are virtually zero, unless one of the big two somehow collapses. 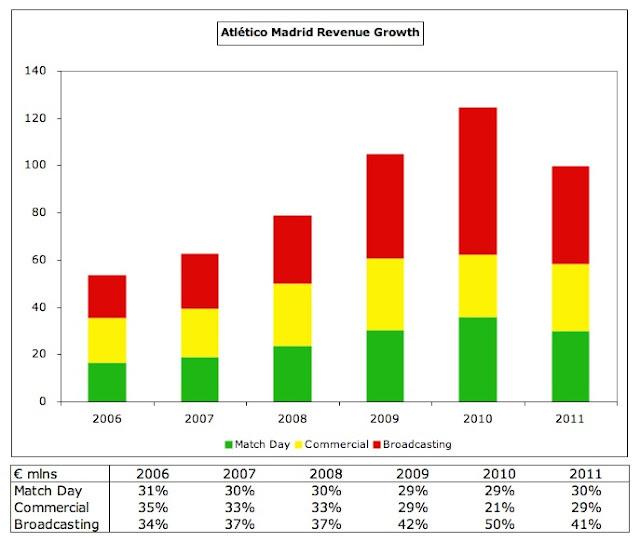 Like most other clubs, Atlético’s revenue growth has been largely dependent on television, rising from €18 million in 2006 to €41 million in 2011 on the back of larger domestic deals. That actually represents a €21 million reduction from the €62 million registered in 2010, which was boosted by European success. If match day revenue is also included, revenue from European competitions fell €25 million between 2010 and 2011, which exactly matches the club’s decrease in total revenue from €125 million to €100 million. Broadcasting is now worth 41% of Atlético’s revenue and accounted for an even larger proportion (50%) when Champions League money was received. In fairness to Atlético, they have also managed to grow their other revenue streams with match day income rising €13 million (79%) from €17 million to €30 million since 2006 and commercial revenue increasing by €10 million (54%) from €19 million to €29 million in the same period. 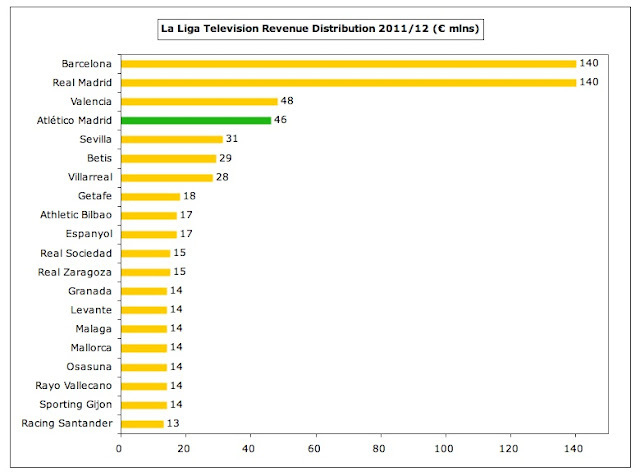 Despite increases in television revenue in 2011/12, Atlético’s €46 million is still a fraction of the €140 million that Real Madrid and Barcelona each receive, even though it is the fourth highest in the league, just behind Valencia’s €48 million and well ahead of Sevilla’s €31 million. Unlike all the other major European leagues which employ a form of collective selling, Spanish clubs uniquely market their broadcast rights on an individual basis, so Real Madrid and Barcelona on their own receive over 40% of the total TV money in La Liga or 11 times as much as the €13 million given to the bottom club. The current approach of “every man for himself” really only benefits the big two and undermines the overall potential of La Liga, as noted by Professor Gay, who suggested that “clubs never think about how to maximise their collective worth.” This is a valid point, given that La Liga’s TV rights revenue of €0.6 billion is a long way behind the Premier League’s current €1.4 billion (rising to an estimated €2.2 billion in 2014). In fact, they have now been overtaken by the Bundesliga (€0.7 billion) and Serie A, whose return to a collective deal helped grow TV rights to just under €1 billion. As well as more revenue, this might also help clubs like Atlético plan for the future with more certainty, as noted by Gil Marin, “Because there is no ordered model for exploiting TV rights, the clubs have to wait until just before the championship begins to see if the broadcasters can agree. The uncertainty means it’s impossible to set out any social, sporting, commercial or economic strategy for the club.” Indeed, the clubs could get caught in the crossfire of the latest disagreement between pay-TV operator Prisa and the Mediapro agency. Atlético’s television revenue for 2010/11 included just €2.9 million from the Europa League, which was a sizeable decrease on the €21.4 million received the previous season from Europe (Champions League €15.1 million plus Europa League €6.4 million). This will rise again to €10.5 million in 2011/12 following the Europa League victory, though is still much less than the money received by Barcelona (€40.6 million) and Real Madrid (€38.4 million) in the Champions League – and indeed less than the other Spanish representatives: Valencia €18.8 million, Villarreal €13.9 million. This underlines the importance of qualifying for Europe’s flagship tournament, especially as prize money will increase from next season. Atlético are the third best-supported club in Spain with an average attendance last season of 43,000, only behind Barcelona 75,800 and Real Madrid 74,600. In fact, that fabulous support base has been very loyal over the years with attendances surpassing 42,000 even in the two years in the second division. 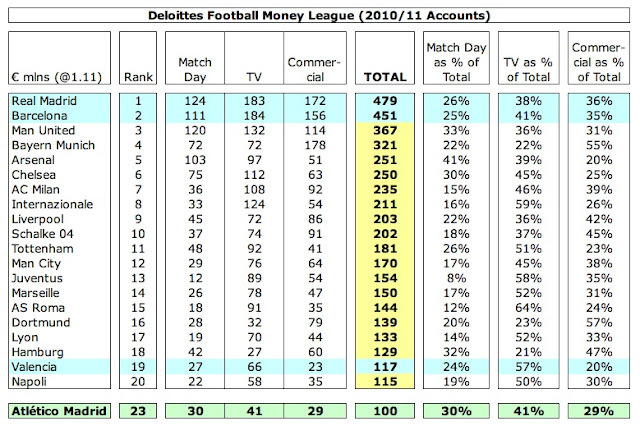 In 2010/11 this produced match day revenue of €30 million, better than eight of the top 20 clubs in Deloitte’s Money League. That’s not bad at all, but (stop me if you’ve heard this one before) pales into insignificance compared to Real Madrid’s €124 million and Barcelona’s €111 million (both around four times as much). On the other hand, 13 La Liga clubs earn less than €10 million match day income, so Atlético cannot complain too loudly about unfair competition – it works both ways. It would be difficult to raise ticket prices, given the dire straits of the Spanish economy, including a very high unemployment rate, especially among the country’s youth, but the club hopes for “ a significant increase in income” when they move to a new stadium that should bring “a new future for Atlético Madrid.” Although it will hurt to leave a stadium so steeped in history as the Vicente Calderón, taking away some of the club’s unique identity, a new multi-purpose stadium with more executive boxes and commercial areas should indeed increase revenue, though this has not been quantified. The stadium capacity should rise from the current 55,000 to 67,500 in a site that was designated as part of Madrid’s unsuccessful 2016 Olympics bid on the other side of the town. Atlético’s website states that it will cost around €200 million to build, which has already been paid by the sale of land around the Calderón to the brewers Mahou for development. At one stage, it looked like Atlético would make a large profit on this project, but it now seems like they will essentially just cover their costs. Discussions on this project started in 2007, but final planning permission was only received in late 2011 for a project involving new road access (and the burial of the M-30). Although club president Enrique Cerezo suggested last year that the new stadium would be ready for the 2014/15 season, it now looks like 2015/16 may be a more realistic deadline. Naming rights have been mentioned, but it is fair to say that most Spanish clubs are struggling commercially. It is the same old story here with the big two once again dominating. Atlético’s commercial revenue of €29 million is actually the best of the rest, but is at least €125 million less than Real Madrid and Barcelona. In fact, Real Madrid’s €172 million is about the same as all the other La Liga clubs combined (except Barcelona). It’s not going to get any better in the short-term for Atlético, as they lost their main shirt sponsor Kia, who had been paying €7 million a season, at the end of 2010/11. At the time, President Cerezo claimed, “our jersey is worth between 5 and 8 million euros”, but no permanent replacement has been found, though Kyocera still sponsor the back of the shirt. Instead, Atlético have been forced to adopt a piecemeal approach, e.g. last season there were deals with Colombia Pictures whereby a different film was promoted each week; and Rixos Hotels for eight of the last nine games. Now Huawei Telecomms, having sponsored last season’s derby, will be sponsors for the first three games of this season. 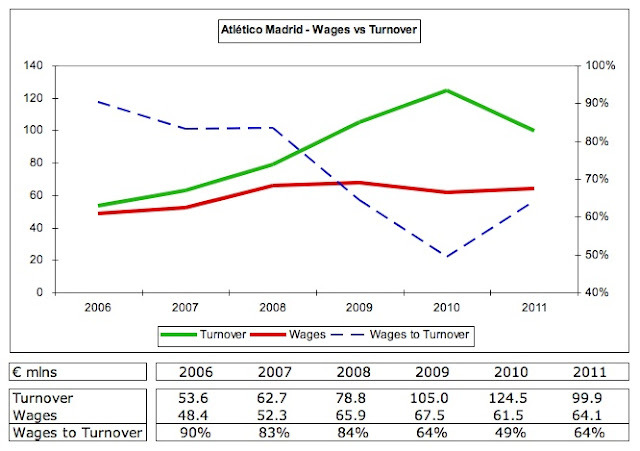 To their credit, Atlético have done well in controlling the wage bill, as can be seen by the important wages to turnover ratio falling from 90% in 2006 to 64% in 2011 (and as low as 49% in 2010). In this period, revenue rose €46 million (86%), while wages only grew by €16 million (32%). Their wage bill of €64 million is still the third highest in Spain, just ahead of Valencia €61 million and Sevilla €57 million. The revenue theme is thus repeated in costs, as Atlético are once again only lower than the big two, but significantly lower, with Barcelona spending €241 million and Real Madrid €216 million. 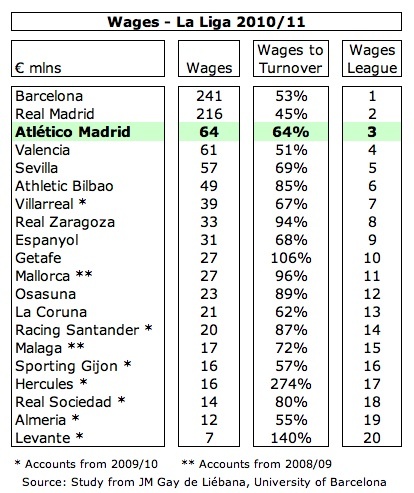 It should be noted that Atlético’s wage bill grew €3 million in 2011, despite the €25 million drop in revenue, so there is still work to do in this area. They could start by looking at the salary of Gil Marin, which has averaged €1.2 million a year for the last three years, even though club statutes prohibit such payments if the club makes losses. Whatever. The critical point here is that the big two have (understandably) used their growing wealth to spend even more on their players, a vicious circle that kills off any hope of domestic competition. In the last four years, the wage bills at most Spanish clubs have hardly grown at all, while those at Barcelona and Real Madrid have surged (by €86 million and €49 million respectively). In this way, the gap between Atlético and Barcelona has expanded from €102 million in 2007 to €177 million in 2011, a veritable abyss. The other major player cost is amortisation, i.e. the annual cost of writing-down a player’s transfer fee, which has fallen by €15 million from the peak of €38 million in 2009 to €23 million in 2007, as a result of the slowdown in the transfer market. In future, this will increase as a result of purchases like Falcao, but will also fall if there was any amortisation remaining on players that have departed, so the net effect is likely to be fairly small. Another headache for Atlético is the implementation of UEFA’s Financial Fair Play rules that force clubs to live within their means if they wish to compete in Europe. Allowable losses are an aggregate €45 million for the first two years (then three years), but this falls to only €5 million if they are not covered by the owners, which might be an issue for Atlético. 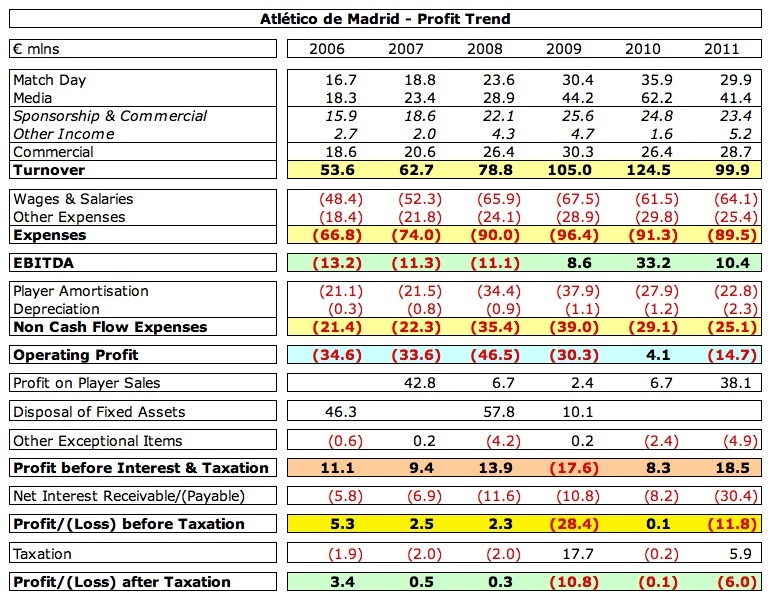 As we have seen, FFP could be problematic, as Atlético’s 2010/11 loss excluding player sales and other exceptional items was €45 million. What this effectively means is that Atlético can only hope to meet the break-even target by either selling players or qualifying for the Champions League – though that task should not be beyond them, given Villarreal’s relegation and Malaga’s internal strife. It should be noted that the costs of building the new stadium would be excluded from the FFP calculation, so that will not be an issue. Similarly, any expenses attributed to youth development are also excluded, so this should be an area of focus, certainly more than in the past, when Jesús Gil once actually closed the academy, resulting in Raúl moving to Real Madrid, where he proceeded to score over 200 goals. Although things have improved since then with the likes of De Gea and Alvaro Dominguez coming through (and being sold for large fees), there is still room for improvement. Atlético’s financial future is also inextricably linked to how Spanish football fares in general – and the picture does not look good. Paradoxically, while results on the pitch have never been better for the Spanish national team and their clubs in Europe (five of the eight semi-finalists in Europe last season came from La Liga), most clubs are struggling off the pitch. In fact, a quarter of the clubs in the top division are in bankruptcy protection, while the beginning of last season was delayed by a players’ strike over unpaid wages and there were threats of similar this season, this time over TV rights and schedules. Spanish football is tolling under the burden of debt, which has reached €3.5 billion for the 20 clubs in La Liga, more than double the annual revenue of €1.7 billion. That said, this is not a new issue with debt being about the same level for the last four years, a sign that football remains a remarkably resilient industry. 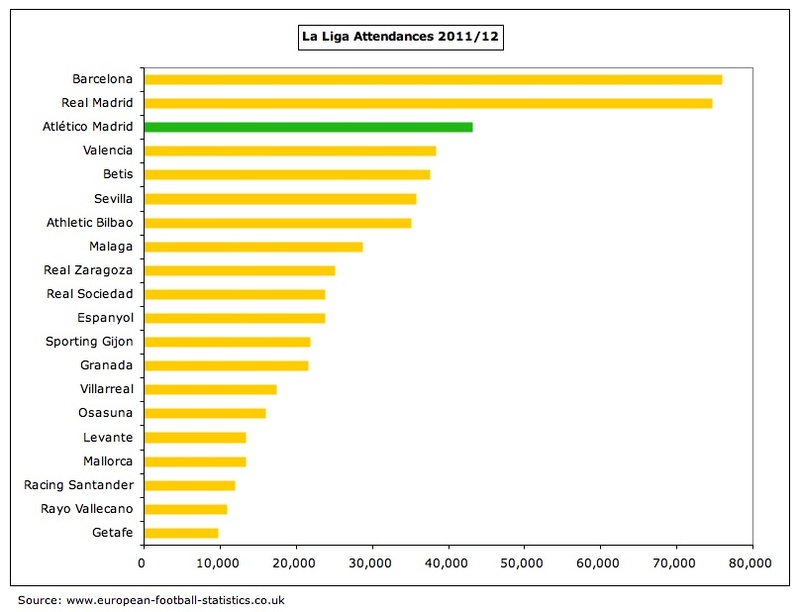 However, there is no room for complacency and the Spanish Football League (LFP) has now taken action. Up until recently, it was unable to impose any meaningful sanctions on financial miscreants, but a new law came into force in January 2012 that now permits the authorities to relegate a club in administration – though whether they have the stomach for a confrontation with a major club’s supporters is debatable. "Turan - the Arda they come"
Although Atlético Madrid are a good club with great fans, their financial disadvantages (even after attempts to put their house in order), compounded by an almost unparalleled ability to shoot themselves in the foot, mean that they are unlikely to break the duopoly at the top of La Liga in the near future. However, they have a realistic chance of qualifying for the Champions League this season, which would go a long way to help resolve their money issues – just so long as the tax authorities (and other debtors) remain patient and don’t call in their debts. As an Atleti supporter with limited Spanish it's great to see all this information laid out in English so a layman like me can understand it. Very informative, but also very disturbing. I wouldn't be surprised if Cerezo will soon be prompted to sell Juanfran, Godin, Adrian, Turan, and Falcao in a fire sale fashion, just as what Cragnotti did to Lazio with its marquee players in 2003-2004. Outstanding work explaining complex financial details in easy to understand language. As a long term fan of La Liga, my side Sporting Gijón got relegated and if they don't come back up at the first attempt, then they will be stuck in the cesspool. La Liga and the LFP are a joke, it really should just have a best of 39 series between Barcelona and Real Madrid. No financial governance at all, unlike in England or Germany clubs not getting punished for going into financial administration. 6 clubs in the top division last season Zaragoza, Granada, Mallorca, Racing Santander, Betis and Rayo Vallecano were in admin. No 10 point penalty, a whole lot of nothing. Atleti fans don't deserve to have these parasites as owners and Jesus Gil I remember when they won the double and he was asked the difference "This year we have a right bunch of men, last season we had a punch of poofters who walked off the field because they had runny noses". Even if they somehow manage to get rid of Gil and Cerezo how do they know the new owners won't be worse. Not like they have the clubs best interests at heart or believe in financial responsibility. If Jorge Mendes is involved then it can never be good. 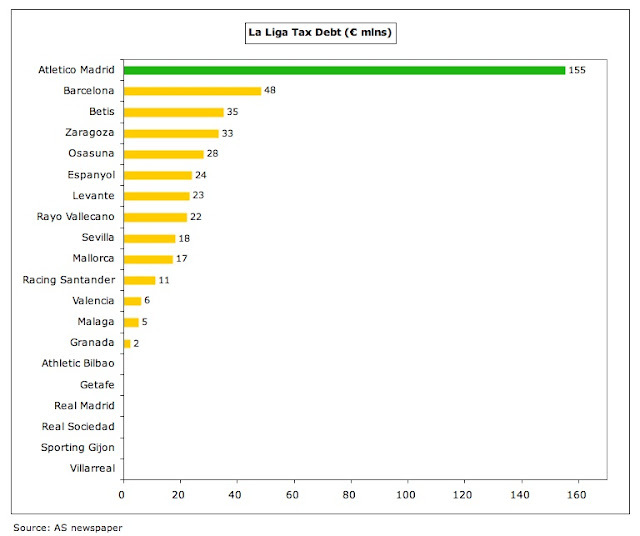 Not sure if they will ever pay their taxes, then again the LFP won't apply sanctions to the cycle continues. They need to get rid of 3rd parties ownership of contracts. The Germans should run La Liga, the situation where the Big 2 are just swallowing up everything to the detriment of the competition has lead to a player drain from the other Spanish clubs to Germany or England. Even if there was a collective TV deal not like Barca or RM would lose their dominant position in the market. 1. Arsenal reached the knock stage of CL and ManU got knocked out earlier however they got more CL money than Arsenal. Initially I thought it may be linked to league position but then City are not in your table so I cannot say if they got more money than United. Any explanation ? I'd suggest the wandering gypsies of Woolwich return to their homeland and raise the price of prawn sandwiches to cover the growing deficit. If you think Atlético's debts are massive and their club is poorly run, you should take a look at the three biggest clubs in Portugal. Total debts of Porto are at least 300M€ (Their remaining stadium debt is unclear). Sporting had their finances audited for the whole group early this year, and it now stands over 400M€. 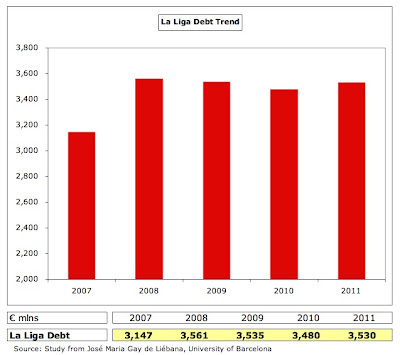 Benfica has total debts of around 500M€. Not only that, but their turnover is much smaller than Atlético's (since 2009). 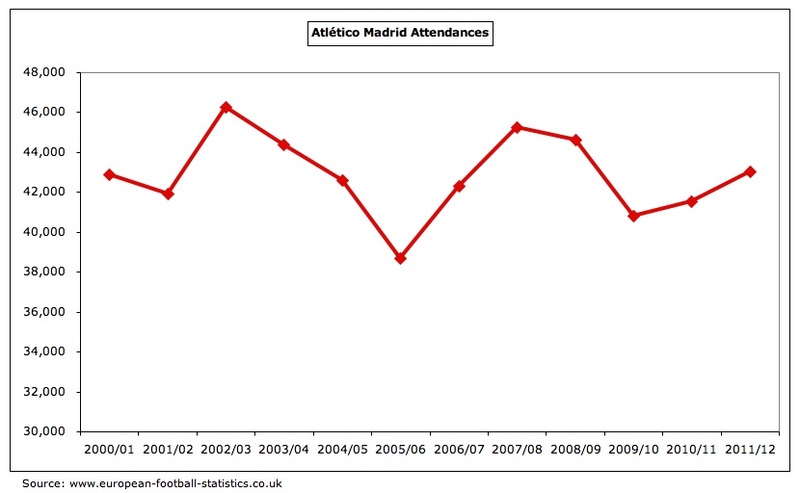 The last 25 years, the time since the Gils got hold of Atleti have been an eyewatering succession of shameful events. To qualify them as poor management is being indulgent. Should we have a fit and proper person test in Spain, all the clauses in the test would have been breached by this family. Thank you so much for this report, which I have been waiting for years, as an Atlético fan who does not trust Spanish sports press (like any self-respecting Spanish footballf fan by the way). Your blog is a true gem, and the amount of work you must pour into it must be hard to imagine. If that helps you, for many including myself, yours is the best blog on football finances in the world by a mile and one of the best on football overall. Please become Atlético's Financial Director and you will never get bored. Forza Atleti! Atleti hasta la muerte! Atletico de Madrid til' death! It is great that we can read this impressive and clear article in a private blog while no details appear in Spanish (corrupted) press. La Liga is dead, it just need to be buried now. Just FC Barcelona and Real Madrid get all privileges (and money of course), being the rest of the teams just useless third part. They all should stop playing until things get fair. Excellent article. Not sure I can agree with your desription of Luis Aragones as legendary, remembering not only his recent dubious outbursts, but also his involvement in his club's thuggish brutality of the truly legendary Jimmy Johnstone in the 1974 European Cup semi final versus Celtic. Great posts as always sir. By any chance, do you have a quick update on the Schalke 04 debt situation? Excellent article, which seems to say that Atletico are doing pretty well given the nature of the sloping pitch that is La Liga. Thanks. Yes, I meant two years (24 months) between the two Europa League victories, but accept that this was misleading, so have now corrected. Atletico's chief just said if they dont qualify for CL this season they will have to sell Adrian, Turan and Falcao, maybe more. As a fan of FC Barcelona, it must be stressed that although there needs to be a collective TV deal for all teams to enjoy TV money, we must remember that the "Big Two" are not responsible for the financial mess that the other clubs are in. The "Big Two" aren't responsible for the idiocy of Soler mounting tonnes of debt on Valencia, and they sure as hell aren't responsible for the criminal Presidents such as the Gil Family and Del Nido of Sevilla. From the perspective of the big two, why should they bail out these clubs, when they have shown themselves to be irresponsible. Obviously the "Big Two" can get into a mess to, but because both are more than sports clubs and more like national institutions they would be able to alleviate any financial mess. 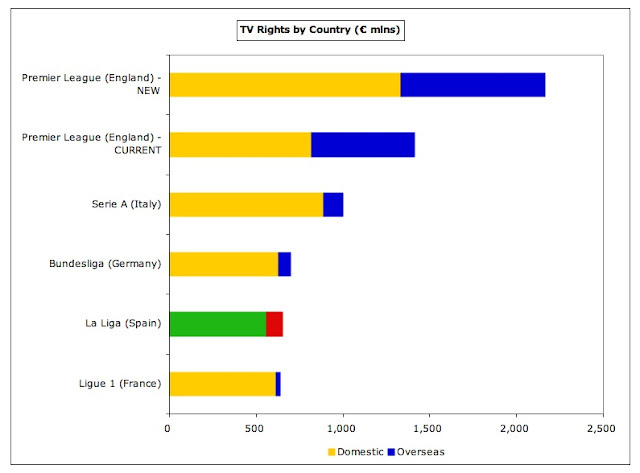 Ultimately would a collective TV Deal be that much of a help to the other clubs. Sid lowe, a football journalist based in Spain had stated that most people want to watch the "Big Two" play and the other clubs viewership is at its best when they are playing the "Big Two". One option that could work would be to help effect change of management in the clubs, but this would create many problems. Personally I would want a collective deal, so some of the smaller clubs can get a chance to compete or at least get out of insolvency, but the history of poor management in most Spanish clubs means that they would probably just squander the extra cash. The big 2 should bail out those clubs for the simple reason that the La Liga is played by 20 teams, not 2 teams, and if the quality of the La Liga teams drop it's virtually impossible for Barca and Madrid not to suffer. A future where no one wants to watch Madrid and Barca play against crap Spanish teams is looking more and more possible, and will happen if nothing is done to solve the woes of the non big 2 clubs in Spain. I have not yet had a chance to read through your article (a fine read I expect to be sure!). However, it is very interesting that the FA yesterday has finally presented a discussion for an FA, ie domestic, regulation of salaries through the imposition of some sort of salary cap in the english game. This is something that exists in the US for a long time. The workings of I understand are complex, but the consensus is that they manage to achieve a greater competitive balance between teams. Do you have any views on whether such system is necessary in addition to UEFA FFP or indeed whether it would redundant to it? I'm doing my own thinking on this, and especially where such rules would be imposed in the england but not in the other EU markets (noting the ever culprits Barca and Real), would this utlimately damage the english teams in terms of CL success (though obviously their ability to participate would not be affected). This is an amazing article. I would love to do some data work myself (mostly comparing and contrasting the rise of Tottenham vs. the rise of Man City) and I must ask: where do you get your data? Surely you don't go through annual reports one by one... but if you do.. Bravo. 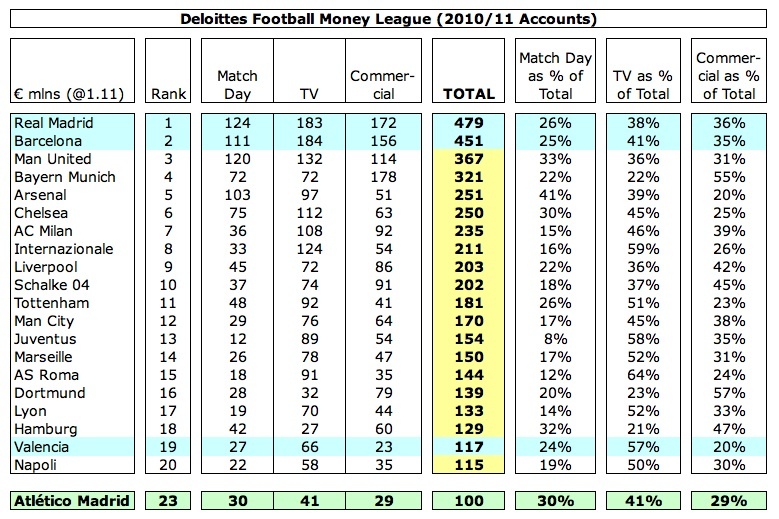 FFP gives us a fascinating look at overspending and competitive parity. Knowing where this data comes from is a huge first step to figuring out more. Thanks! great article,everything said is true. but two years later, we won the league, how can it be posible? ... Atlético is different, Atlético is passion.